This weekend is Museums at Night and it’s a great opportunity to get out and enjoy your favourite museums after hours. Tonight at London Transport Museum we’re hosting a ‘Brightest London’ Friday Late filled with art, animations, dressing up, drinks, tours, readings and a fantastic quiz! To celebrate our Brightest London night, we’ve chosen another gem from our Poster Art 150 exhibition – Brightest London and home by Underground (1924) by Horace Taylor. 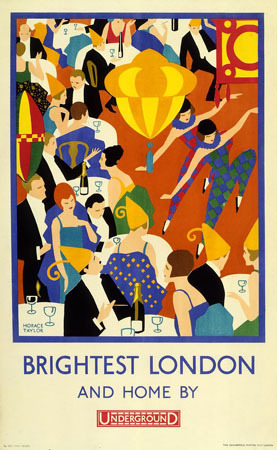 This poster was issued in November 1924 in the run up to Christmas, hence the bright lights, party hats and streamers! The festive atmosphere shows London’s most stylish residents enjoying a modern and sophisticated night out; the Champagne bottles and coupe glasses on the tables, along with the men’s ‘white’ tie’ dress (the most formal evening dress code in Western fashion), subtle indicators that this is a very special occasion! Such associations between luxury, affluence and Underground travel helped to reinforce the idea that the smart set always used the Tube. Indeed, Underground posters often depicted a fashionable crowd as this made Underground travel seem stylish and aspirational – an important part of encouraging passengers to make use of off-peak services. Earlier this year we also blogged about the counterpart to this poster, ‘Brightest London is best reached by Underground’. This poster showed sophisticated Londoners heading down the Tube escalators on their way to a night out on the town. Can you spot any of the same passengers from that escalator poster in this party poster? During our Friday Late tonight you’ll have the opportunity to dress up in bright clothes and hats for photo-shoots based on this poster! We’re looking forward to seeing you at Brightest London!